The BELT BAG buckles to your waist. Holds game ball and keeps it dry. Measures 13" long by 6" wide. Color: navy blue. 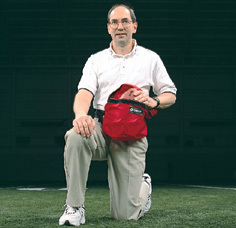 The DOUBLE BELT BAG holds two balls. Made expressly for the NFL. Measures 27" long by 6" wide. Color: navy blue.